Why Does Uncle Sam Borrow? The Unites States government operates a fiat currency system. The government is therefore the monopoly supplier of the final means of payment in our dollar-based economy, and is ultimately responsible, in one way or another, for any net increase in dollar-denominated financial assets in the private sector. And yet, we continue to hear bipartisan expressions of fear and angst about the budget deficit and the national debt. Both major parties seemingly agree that we are “out of money”. They wrangle over various competing approaches to shrinking the gap between tax revenues and government spending. They appoint commissions to study the government budget and recommend some combination of slashed spending and higher taxes in order to close that budgetary gap. They warn us that we will transform ourselves into banana republic status if we do not urgently address our public debt problems. This situation should be perplexing. Why does a government that is the issuer of the national currency have to borrow that currency back from the public to which the currency is issued? And how could such a government ever experience the kinds of budgetary squeezes and debt burdens that can pose severe problems for households and businesses? I wish to make a radical suggestion: Public borrowing is an outdated practice, and we could dispense with it entirely. Borrowing by the public treasury and the accumulation of government debt obligations are legacies of the era that preceded the development of modern fiat currency, an era when governments were primarily users of traditional means of payment that lay outside their control, and not the producers and issuers of the primary means of payment. That pre-fiat era is now dead in the US, and the chief remaining role of government borrowing in our time is to bamboozle the public, and to obscure the true nature and effects of government fiscal and monetary operations under a bewildering maze of bookkeeping ink and financial legerdemain. Eliminating public borrowing, and replacing it with operations that are simpler, more direct and more transparent, would advance the cause of informed democratic debate over public spending and taxation. Above all, the change would eliminate needless obscurity and confusion and help us all understand exactly whose bread is being buttered by the budgetary decisions made by politicians. In Part 1 I argued that Beltway progressives aided and abetted deficit hawk Pete Peterson in his efforts to gut the last remaining vestiges of Roosevelt’s New Deal. By adopting Peterson’s views on government finances, they were unable to provide a progressive alternative to budget cuts. Since Republicans were willing to make a Custer’s Last Stand on the debt limit, and since President Obama was Wall Street’s designate to privatize healthcare and retirement, Democrats needed that progressive voice. But Beltway progressives had already caved, for reasons I discussed. Indeed, it appears even worse than that. Yves Smith already blew the whistle on three progressive research groups (Roosevelt Institute, Economic Policy Institute, and the Center for American Progress) that produced reports with funding from Peterson. These reports adopted the deficit hysterian’s argument that the US budget is on an “unsustainable” course, and advocated a return to “fiscal responsibility”. Getting progressives to adopt neoliberal terminology was a real coup for the deficit hawks. With such hyped-up talk, there was no doubt that Obama would be able to put Social Security and Medicare on the chopping block. I have recently discussed what I see to be problems with the Roosevelt Institute’s report over at FDL. This was also the main target of Yves. (Go here). Let me say, however, that I think critics have been too hard on these three groups. I have argued that taking tainted money from Peterson can be justified if one uses the money to produce progressive research. I am sure all three groups believe that is precisely what they did—they thought they would get a progressive view into the debate, something that had been sadly lacking. In their budgeting exercises, they preserved what they saw to be progressive programs, they budgeted some new progressive programs, and they shifted tax burdens to higher income individuals and corporations. Surely, they believed, that is better than standing on the sidelines and letting Peterson choose which programs to cut? I get that. I sympathize with them. But here’s the problem. They accepted—at least implicitly—the Peterson agenda. Deficits and debt ratios have to be reduced, if not immediately then eventually. In other words, they budgeted, but with Peterson’s Austerian constraints. I do not know if Peterson demanded that they submit budget projections that showed debt and deficit reduction relative to the base case. But the RI proudly displays on the report’s homepage projections of very significant debt reduction relative to the “do nothing” baseline. (see here) In other words, they accepted the premise that debt and deficit ratios should be reduced. Once that is done, there is nothing to do but cut some programs and raise taxes. Part 1 should have made clear, however, that progressives had already moved very close to the Peterson view before he put them on the payroll. For a variety of reasons they had already adopted a “deficit dove” position. The difference between a hawk and a dove is this: hawks want deficit reduction more-or-less immediately. Many of them hold the position that deficits are always bad because they always cause inflation and slow economic growth. The extreme hawk position is that even now, with official unemployment above 9%, government spending should be reduced. There is no plausible economic theory standing behind that position—it is ideological, or as Representative Ryan put it, it is a “moral” position. More “reasonable” hawks are willing to wait until a stronger recovery gets underway. Even Pete Peterson is on record favoring postponement of deficit-cutting until 2012 (see below). By contrast, deficit doves believe that deficits are not only OK in a deep recession, they are even necessary. (Prominent deficit doves include Paul Krugman as well as many of the writers at New Deal 2.0 as well as individuals at the three institutions that accepted Peterson’s funds.) However, doves believe that “eventually” deficits need to be cut so that debt stops growing; they typically want to stabilize the debt-to-GDP ratio at some level. Some admit that the choice of a final resting place for the debt ratio is somewhat arbitrary—perhaps it should be 60%, or perhaps 100%. But doves are sure that 200% is worse than 100%, and that 100% is worse than 60%. Thus, “eventually” deficits must be cut—and that means hard choices. A progressive dove can be identified by her preferred means of obtaining that final “sustainable” debt ratio. Tax increases on the rich and on corporations are good. Reductions in military spending and subsidies for corporate agriculture and oil companies are advocated. Raising taxes on the poor and cutting their benefits are rejected by progressive doves. The problem is that most progressives accept the intergenerational warrior’s claim that “entitlements” (Roosevelt’s New Deal) will bankrupt the nation 25 to 50 years down the road. And those portions of the budget are already large and growing. Hence, as Peterson and his minions have argued for years, “TINA”—there is no alternative to hacking away at entitlements. The more progressive doves advocate relatively small tweaks to Social Security (raising or eliminating the “cap” so that higher income folks contribute more payroll taxes; raising the retirement age; taxing benefits received by high income retirees; reducing the COLAs; and so on) or bigger tweaks to Medicare and Medicaid (greater emphasis on cost control—some go so far as to recommending the “public option”—or to slow health care cost growth more generally, using centralized bargaining over drug prices). The game played then becomes one of finding the least painful way to reduce longer-term budget deficits and growth of debt in order to move the government’s finances back toward “fiscal responsibility”. That was a long excursion by way of introduction to what follows—an examination of EPI’s “progressive budget”. I want to make clear three points about EPI. First, EPI’s progressive credentials are not in question. It is without doubt the most important progressive voice in Washington. Second, EPI’s preferred budget was created before it accepted any Peterson money. I will actually refer to the budget it published in 2010, long before Peterson solicited EPI to produce a report. In all important respects, the earlier budget is the same as the budget EPI produced for Peterson. Thus, those critics who have argued that EPI “sold out” to get Peterson funds are wrong. And, finally, I want to say that much of the budget is indeed “progressive”—it preserves progressive programs, it adds funding for new progressive programs, and it shifts taxes to higher income individuals and corporations. It obtains deficit and debt reduction mostly by increasing taxes. We could quibble over the allocation of funds or the budget priorities of EPI, but I have no problem agreeing that the priorities are consistent with a progressive agenda—albeit not necessarily one I would endorse. Further, EPI has been steadfast in its protection of Social Security. Unlike some other progressives, for example, EPI has rejected any attempt to cut benefits by raising retirement ages or fiddling with COLAs. So I want to make clear that when I criticize Beltway progressives for aiding Social Security’s enemies I am not including EPI, which has been a strong voice in support of Social Security. More generally, it legitimizes the arguments of fiscal conservatives who want to reduce the role of government in the economy. For the purposes of my analysis, I will compare an EPI report from 2010 (before EPI received funding from Peterson) with a Peterson-funded report from 2009, both of which provided “blueprints” for deficit and debt reduction. As one might expect, the dovish EPI report preserves and even enhances spending on progressive programs, while raising taxes on higher income individuals and corporations. The Peterson report is much more hysterical about a looming financial crisis if we do not do something immediately about unfunded entitlements. Further, the EPI budget would move toward deficit cutting much more slowly, and would stabilize the debt ratio at a higher level. Still, as one reads the EPI report, one is struck by two things. First, both the goals of the research exercise as well as the major points made are remarkably similar to the earlier Peterson diatribe on the coming fiscal crisis: medium-term and longer-term deficits and debt ratios need to be reduced. I will next examine those similarities. Second, while EPI adopts a dovish position on budget deficits and debt, it offers no serious argument to justify that position. It simply takes as granted the belief that rising debts and deficits are bad, and the bigger they are the badder they are. I surmise that EPI simply presumes that everyone “knows” government deficits and debt are bad, so no explanation is required. Everyone, that is, within the Washington beltway. I suppose that because they all breathe the same hyperventilator’s air, it is just so obvious that Beltway progressives do not need to consider the assumption that the US is on an “unsustainable” course. Note that of the 5 bullet points that summarize the blueprint, three address the supposed debt and deficit problems. Bullet 2 argues for stabilizing and then reducing the debt ratio; Bullet 4 argues for increasing tax revenues; and Bullet 1 postpones blood-letting through spending reductions until unemployment falls to 6%. It is also important to note, however, that EPI recognizes that it does no good to shift debt from government to households—so, for example, reducing Medicare costs by putting them on households only reduces government deficits and debt by increasing household deficits and debt. Let us look at EPI’s projections, that compare the “do nothing” scenario against Obama’s proposals and the EPI proposals (labeled “OFS” for “our fiscal security”). This graph shows that EPI’s proposals will cut the deficit to GDP ratio by almost half over the medium term. Our suggested budget blueprint achieves lower deficits in the medium term and balances the primary federal budget (the year’s current revenue and spending, not counting interest payments on past debt) in less than a decade. This path recognizes the need to increase revenue while targeting certain areas for reductions in spending; in particular, our proposed path reallocates spending away from the Department of Defense by adopting common sense spending reductions. Finally, the blueprint protects core priorities such as Social Security and health care from economically counterproductive reductions in benefits. The net impact of the spending and revenue adjustments we put forth in this blueprint will produce the following short- and long-term results: • Substantial and sustained increased funding for job creation and investments, especially in the near term; • A budget path that significantly improves the 10-year budget window; • A transition from a primary deficit to a primary surplus in 2018, and sustainable debt levels by the end of the decade; • An improvement in the path for public debt in the long term (stabilizing debt as a share of the economy beyond 2025); • A solid footing for Social Security, Medicare, and Medicaid for the long term; • A modernized tax code that raises adequate revenue fairly and efficiently. The following figure shows a significantly lower long-term debt trajectory as a result of EPI’s proposals. Throughout the report, EPI refers to “fiscal security”, “fiscal responsibility”, a “sound fiscal path”, “sustainable debt”, and the current “unsustainability of the national budget”. None of these terms is ever adequately defined. The report also discusses the “75 year fiscal gap”, that must be reduced to “stabilize the debt ratio at today’s level”, requiring tax increases or spending reductions amounting to 7-9% of GDP. It warns that the government is not raising sufficient revenue to cover its expenses and that we cannot face national challenges without adequate funding and a return to fiscal responsibility. I will return to these claims below. e) high debt ratios could threaten confidence in government debt. The Peterson report is much more hysterical about the possibility—nay, near certainty—of a fiscal crisis if debt ratios are not reduced. It also adds to the list above the possibility that deficits will spark inflation and devaluation of the dollar, and claims that deficits slow economic growth. But in general outline, the two analyses warn of similar dangers without providing any serious discussion of the mechanisms through which deficits and debts generate these outcomes. Let me stick to the EPI fears. While we probably disagree about operational details, I suspect EPI agrees that government can make all payments as they come due in its own sovereign currency—that is a position to which even Ben Bernanke, Alan Greenspan, and Paul Krugman subscribe. But if that is so, I do not see how a “fiscal crisis” can be triggered. Let us say that market confidence in Treasuries is shaken. A sovereign government can offer to redeem all of them—that is, stand ready to pay off interest and principal by crediting bank accounts with US dollars. Yes, I know that the inflation hyperventilators are already screaming. But EPI did not list inflation as a possible result; it listed fiscal crisis. How can you have a fiscal crisis when you spend your own currency? EPI is silent on the matter. The EPI report lists two types of crowding out. The first is the old and thoroughly discredited loanable funds idea: there is a fixed amount of loanable funds in markets and if government borrows, there is less available for private firms. Interest rates rise, investment falls, and growth suffers (one of the Peterson claims). There is also an ISLM version—but that is equally discredited (all modern macro has a horizontal LM curve) and too wonky for this blog. One must conclude that EPI’s macroeconomics is based on pre-Keynesian theory. Actually, finance is not a scarce resource. (Anyone who thinks it is scarce had a Rip Van Winkle nap during the last two decades, when finance was more abundant than hot air within the Beltway.) Government deficits cannot financially crowd out investment. Yes, if we went beyond full employment of all resources, more government spending could crowd out private spending because there would be no real resources to devote to production of additional output. But it is pretty clear that EPI is not worried about real resources, since its Blueprint devotes Bullet 3 to ramping up public investment. The second kind of crowding out listed is based on the belief that government faces a fixed budget so that if it spends more on interest it must cut spending (or raise taxes) elsewhere. This is also related to the view popularized by neoliberals Reinhart and Rogoff that low debt ratios are good because when a crisis hits there is fiscal policy space that can be used for bail-outs and stimulus packages. But that means EPI is using a circular argument: we must reduce the debt by cutting spending because the debt imposes a constraint on spending. The reality is, as all those reading this blog know well, a sovereign government is never financially constrained in its own currency. Government spends by keystrokes. It can stroke keys to pay interest and as well stroke keys to undertake any progressive spending policies EPI proposes. And it still has “room” to stroke keys for bailouts. There is no affordability tradeoff. What matters is inflation—too much government spending drives the economy to the inflation barrier. And real resource use: a government that takes too many resources for its use (hopefully, to serve the public purpose) leaves too few for the private sector. But that requires full capacity use—otherwise at most you get bottlenecks. Further, as all readers here know, the interest rate is a policy variable. The central bank chooses the overnight interest rate; the short maturity government bill rate tracks that closely since bills are close substitutes for bank reserves. Other rates are more complexly determined. Government bills and bonds are interest-earning alternatives to the rates paid on reserves by the central bank. Let us say that government decides it wants to spend less on interest on longer maturity bonds. Easy enough: stop issuing them. Facing a drought of longer maturity bonds, markets will bid up their prices and rates will fall. Government can stay in the short end of the market as long as it wants; indeed, it can stop issuing even bills and just pay 25 basis points on reserves (as it now does). Yes, this requires a change from current operating procedure. I won’t go through this now as NEP has provided ample analysis of operating procedures and the simple changes that would lead to an era of zero government debt (as conventionally measured, since reserves and currency are not counted). Now, EPI might challenge me: what would my progressive 15 to 25 year government budget proposal look like? My response: I wouldn’t budget for 5 years, let alone 25. It is a silly exercise that only stokes the fires of Peterson’s hyperventilators. The best argument against doing long-term budgeting exercises is here, a co-authored Policy Brief that was based on testimony we supplied to Congress. A quick summary is contained in my FDL piece (here). This blog is already too long to repeat the arguments. Budgeting by sovereign government does make sense, and one could even envision budgeting for particular long-lived projects for periods as long as 25 years. But it makes no sense to project total government spending, taxing, and deficits out to 15 or 25 years, let alone to infinity and beyond. And once we bring in recognition of the three sectors balances and the necessity they sum to zero, the futility of calculating budget deficits for year 2035 becomes obvious. You cannot even get a budget deficit unless the private sector wants to net save and the rest of the world wants to earn dollars by net exporting. To calculate the budget deficit in 2035 we would have to be able to project out the current account balance and the private sector balance. That is something EPI did not do—and so, the whole exercise is not only silly but seriously incoherent from the vantage point of the sectoral balances. In conclusion: critics have wrongly implied that EPI (and perhaps RI and CAP) adopted Peterson’s hawkish approach because they were paid to do so. The similarity between the EPI and the Peterson position on sustainability of deficits and debts predates the funding. The EPI Blueprint does adopt a progressive approach to budgeting, so long as one agrees that progressives should adopt a dovish approach to budget deficits, and that it is progressive to draw up budgets for the far distant future. Personally, I reject both of those stances. But, MMTers are in a distinct minority—we are deficit owls. As I have argued here, most progressives have lined up on the Peterson side because they adopt the deficit dove position. And that is why all progressive policies adopted since the Great Depression are now in danger. Counterfactuals can never be proven. What if Beltway progressives had mounted a strong opposition against Peterson? What if they understood and endorsed MMT? Would Democrats have found the will to call the Republican’s bluff? Would Obama have stood up to the attacks on the New Deal? We will never know. I conclude: progressives have unwittingly aided and abetted the deficit hawks because they do not have any strong alternative to the argument that deficit and debt trajectories are “unsustainable”. 4 Trust Funds, 3 Problems: Why is the Other one so “Healthy”? Every year, the Trustees of Social Security and Medicare issue an annual report that examines the financial status of the various “trust funds” that purportedly sustain these vital programs. Social Security’s (OASI) and (DI) Trust Funds, as well as Medicare’s (HI) Trust Fund all face chronic problems, some in the not-too-distant future. In contrast, Medicare’s (SMI) Trust Fund always receives a clean bill of health. Why is that? Part B of Supplemental Medical Insurance (SMI), which pays for doctors’ bills and other outpatient expenses, and Part D, which pays for access to prescription drug coverage, are both projected to remain adequately financed into the indefinite future because current law automatically provides financing each year to meet the next year’s expected costs. In other words, it is sustainable — INDEFINITELY — because the government is committed to making the payments. Indefinitely. And, as we have argued many times on this site (and elsewhere), the same commitment can easily be made to sustain Social Security (OASI and DI) and Medicare (HI) in their current form. There is no economic justification for cuts to either program. The decision is entirely political. The American people must realize this before it is too late. Approximately a decade ago I wrote a paper with a similar title, announcing that forces were aligned to produce the perfect fiscal storm. What I was talking about was a budget crisis at the state and local government levels. I had recognized that the economy of the time was in a bubble, driven by what I perceived to be unsustainable deficit spending by the private sector—which had been spending more than its income since 1996. As we now know, I called it too soon—the private sector continued to spend more than its income until 2006. The economy then crashed—a casualty of the excesses. What I had not understood a decade ago was just how depraved Wall Street had become. It kept the debt bubble going through all sorts of lender fraud; we are now living with the aftermath. It is ironic that on June 29, 1999 the Wall Street Journal ran two long articles, one boasting that government surpluses would wipe out the national debt and add to national saving—and the other scratching its head wondering why private saving had gone negative. The caption to a graph showing personal saving and government deficits/surpluses proclaimed “As the government saves, people spend”. Almost no one at the time (or since!) recognized the necessary relation between these two that is implied by aggregate balance sheets. Since the economic slowdown that began at the end of 2000, the government balance sheet has reversed toward a deficit that reached 3.5% of GDP last quarter, while the private sector’s financial balance improved to a deficit of 1% of GDP. So long as the balance of payments deficit remains in the four-to-five percent of GDP range, a private sector surplus cannot be achieved until the federal budget’s deficit rises beyond 5% of GDP (as we’ll see in a moment, state and local government will continue to run aggregate surpluses, increasing the size of the necessary federal deficit). [I]n recession the private sector normally runs a surplus of at least 3% of GDP; given our trade deficit, this implies the federal budget deficit will rise to 7% or more if a deep recession is in store. At that point, the Wall Street Journal will no doubt chastise: “As the people save, the government spends”, calling for a tighter fiscal stance to increase national saving! Turning to the international sphere, it should be noted that US Goldilocks growth was not unique in its character. [P]ublic sector balances in most of the OECD nations tightened considerably in the past decade–at least in part due to attempts to tighten budgets in line with the Washington Consensus (and for Euroland, in line with the dictates of Maastricht criteria). (Japan, of course, stands out as the glaring exception—it ran large budget surpluses at the end of the 1980s before collapsing into a prolonged recession that wiped out government revenue and resulted in a government deficit of nearly 9% of GDP.) 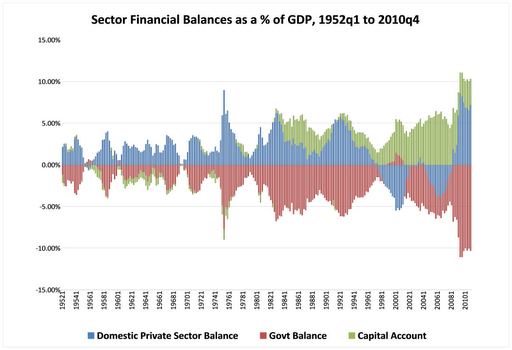 Tighter public balances implied deterioration of private sector balances. Except for the case of nations that could run trade surpluses, the tighter fiscal stances around the world necessarily implied more fragile private sector balances. Indeed, Canada, the UK and Australia all achieved private sector deficits at some point near the beginning of the new millennium. This chart shows the “mirror image”: a government deficit from 1980 through to the Goldilocks years is the mirror image of the domestic private sector’s surplus plus our current account deficit (shown as a positive number because it reflects a positive capital account balance). During the Clinton years as the government budget moved to surplus, it was the private sector’s deficit that was the mirror image to the budget surplus plus the current account deficit. This mirror image is what the Wall Street Journal had failed to recognize—and what almost no one except MMT-ers and the Levy Economic Institute’s researchers understand. After the financial collapse, the domestic private sector moved sharply to a large surplus (which is what it normally does in recession), the current account deficit fell (as consumers bought fewer imports), and the budget deficit grew mostly because tax revenue collapsed as domestic sales and employment fell. Unfortunately, just as policymakers learned the wrong lessons from the Clinton administration budget surpluses—thinking that the federal budget surpluses were great while they actually were just the flip side to the private sector’s deficit spending—they are now learning the wrong lessons from this crash. They’ve managed to convince themselves that it is all caused by government sector profligacy. Especially, spending on public sector workers. For example, Wisconsin Governor Walker’s attack on workers has been taken on the pretext that state employee wages and pensions have driven the budget into deficit. We all know that is ridiculous. The reality is simple: Wall Street crashed the economy, crashed state revenues, and crashed workers’ pensions. Washington responded with a massive bail-out for Wall Street—perhaps $25 trillion worth. It gave a mere pittance to “Main Street” in its $1 trillion stimulus package. Since the recession manufactured on Wall Street cost the economy a lot more than that, Main Street is not on the road to recovery. No one is projecting that jobs will return for many more years. It is delusional to believe that economic recovery can really get underway until we have added 8 million jobs. In other words, the fiscal storm that killed state budgets is the same fiscal storm that created federal budget deficits. You cannot lose about 8% of GDP (due to spending cuts by households, firms and governments) and over 8 million jobs without negatively impacting government budgets. Tax revenue has collapsed at an historic pace. State governments really do need to balance their budgets, and they really do need tax revenue to finance their spending or to service debt. The federal government, as the sovereign issuer of the currency is in a different situation. I will not go through the MMT approach to sovereign currency spending as all readers here are familiar with that. My point is that states really are facing a funding crisis. The federal government does not face a solvency constraint and it can always afford to buy anything for sale in dollars. Still, as we all know, Washington Beltway insiders have manufactured a fake budget crisis to serve political ends. State spending cuts (or tax increases) will not restore their budgets. Just take a look at the results of austerity in Greece or the UK. 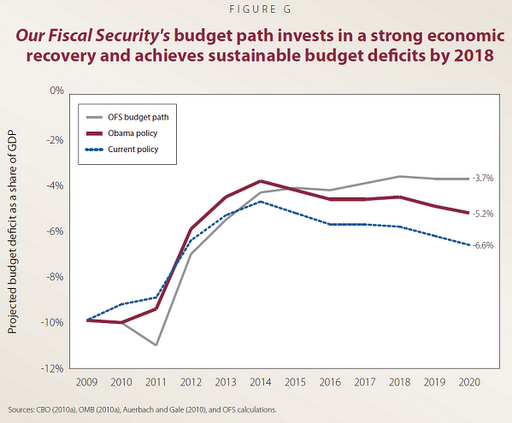 Budget-cutting in a downturn does not reduce deficits significantly. The reason is obvious: austerity slows the economy and reduces tax revenue. Art Laffer’s supply siders were onto something, although they mostly got it the wrong way around. Yes, a booming economy will generate a movement toward balanced government budgets. They thought that tax cuts are always the answer to everything—cut tax rates and you get more tax revenue. I would not say that that never works, but it didn’t when Presidents Reagan and Bush tried it. However, if we get the Laffer Curve the right way around, we can use it to explain why austerity in a downturn just makes budget deficits worse. In truth, state budgets will not recover before the economy recovers. And state austerity will just make the economy worse. So, as a Thatcher might say: TINA: there is no alternative–to federal government stimulus, that is. I realize that goes against the deficit hysteria in Washington. But it is the truth. What kind of stimulus makes the most sense? I think we need another trillion dollars, minimum. This can be split equally between aid to the states and extension of the payroll tax holiday. The federal government should provide $500 billion in block grants to the states, on a per capita basis. On the condition that they stop attacking state workers. The funds would be used to replace lost tax revenue—to cover operating expenses (and where possible, to actually increase spending on priority projects). This program would continue until economic growth and job creation reaches established thresholds. Let us say 10 million more jobs or a measured unemployment rate of 4%. The payroll tax holiday would also be expanded, with a moratorium on taxes for both workers and employers until those thresholds are reached. Why penalize job creation with an employment-killing payroll tax? Reward firms for providing jobs by giving them tax relief. Let workers keep more of their hard-earned pay. This is the quickest and best way to give significant tax relief to most Americans. In addition, we need to stop the attacks on unemployment compensation. To be sure, jobs should always be favored over unemployment compensation—but until we get the jobs we must extend the unemployment benefits. Cutting benefits will just prevent the jobs from coming back. These measures are only a first step. We still have a lot of damage to repair—damage caused by Wall Street’s excesses. And we will need to reign-in and prosecute the fraudsters, otherwise they will blow up the economy again. Actually, they are already trying to do that—creating yet another commodities market speculative bubble. It is looking an awful lot like 2006 all over again. However this time, we are down by 8 million jobs and trillions of dollars of household wealth. Wall Street is bubbling up even as the economy as a whole is in the trenches. This bubble will not last long. It is going to crash. That will expose the huge accounting holes in the bank balance sheets. Wall Street will want another 25 trillion dollar bail out. This time, we’ve got to follow Nancy’s dictum: just say no. No day goes by without some deficit hawk trying to spread fear among ordinary Americans about the looming fiscal crisis. One gets the impression that the hawks are competing with one another to see who can come up with the scariest scenario. And it seems to be working. A recent USA Today/Gallup poll found that 64% of those surveyed in the poll disapprove of president Obama’s handling of the federal budget deficit. But Obama’s discretionary stimulus has been very small relative to the magnitude of the crisis we are in, and as discussed here most of the deficit was due to automatic stabilizers. Hence Obama’s policies have little to do with the rising deficit, and public disapproval of his policy demonstrates how misinformed the public is on the issues of federal deficit and debt. What it [the U.S.] can and must do is radically simplify its tax, health-care, retirement and financial systems, each of which is a complete mess. But this is the good news. It means they can each be redesigned to achieve their legitimate purposes at much lower cost and, in the process, revitalize the economy. The authority that he uses to support his claim that the U.S. is bankrupt is nothing other than the I.M.F (and you thought that the I.M.F is rethinking its position on economic policy!). But what exactly does he mean by “simplifying” the tax, health-care and retirement systems? The only thing that comes to mind is downsizing – cut, cut and cut. How else would you achieve the 14% permanent fiscal adjustment that he thinks is needed? According to Kotlikoff, not only will this help put the fiscal house in order but it will also “revitalize the economy”. Moreover, these programs could still be able to achieve their “legitimate purposes at much lower cost”. What could be better? This is the most extreme deficit hawk position that one encounters. There is a legitimate concern about a double-dip recession in the U.S. Household balance sheets are no better than they were before the crisis. Household debt stands at 122% of personal disposable income. The unemployment rate is high and is expected to stay high for the foreseeable future. In this situation the U.S. consumer can by no means be expected to pull the economy out of the hole. U.S. corporations, facing uncertainty about the strength of consumer demand, aren’t hiring despite sitting on huge piles of cash. Just what exactly will fill the aggregate spending gap when the government withdraws its spending and how cutting entitlements will “revitalize the economy” is a mystery to me. And probably to Kotlikoff too, since he makes no attempt to offer explanation in this article. According to the IMF closing the fiscal gap will require a “permanent annual fiscal adjustment equal to about 14 percent of U.S. GDP.” (“The fiscal gap is the value today (the present value) of the difference between projected spending (including servicing official debt) and projected revenue in all future years.”) This is the preferred definition of the fiscal gap promulgated by infinite horizon deficit warriors like Kotlikoff. In their world, an adjustment in the government’s fiscal balance from a 9% deficit to a 5% surplus (i.e. 14% adjustment) will take place without any negative effects on the rest of the economy. In the real world, however, we cannot have an adjustment in government’s financial balance without simultaneously having an adjustment in the non-government sector’s financial balance. A 14% of GDP fiscal adjustment means that the non-government sector’s financial balance will also adjust by the same amount, only in the other direction. For example, households could adjust their budgets to run huge deficits to allow the government to tighten its fiscal stance. So what are our options according to Kotlikoff? To achieve this fiscal adjustment we will need nothing less than doubling of all of our taxes. “Such a tax hike would leave the U.S. running a surplus equal to 5 percent of GDP this year, rather than a 9 percent deficit”. (Of course doubling taxes is not something that he seems to be in favor of. This is just used to demonstrate how enormous the “hole” is). But one year will not do it. The U.S government will need to run a 5% surplus for many years to come to pay for scheduled expenses down the road. Since the official deficit and debt numbers don’t look scary enough Kotlikoff offers us his own calculations. You see, the federal debt held by the public stands only at 53% of GDP and is expected to climb up to only about 68% in 2011. Compared to other developed nations this is a relatively low number. One could look at Japan and say: “Well, they have managed not to go bankrupt with a 200% Debt-to-GDP ratio so why would the U.S. be in trouble with a much lower level of debt?” Kotlikoff will then tell you that the fiscal gap is “more than 15 times the official debt”, a whopping $202 trillion. When baby boomers fully retire and collect all of their oversized benefits we will have an annual bill of $4 Trillion in today’s dollars. And if after all of this you still have any doubts then Kotlikoff will point you to the direction of Greece (I won’t go into that in this blog but you can read here on why the U.S. is not like Greece). Who wouldn’t be scared? The alarming situation we are in, according to the deficit hysteria crowd, is the result of the government running a Ponzi scheme for 6 decades as it has been taking resources from the young and giving them to the old. If their point is that we are taking real resources from the young and giving them to the old, then yes, that’s what we are doing. And that’s what every society is doing, has always done, and will always be doing unless you want to let the elderly population die of hunger. Ditto for infants—the lazy do-nothings expect us, the working age population, to take care of them! Why can’t those lazy infants and elderly people pull their own weight? But if it is all about real resources, the debate shifts to a completely different dimension. Will we have enough resources so that baby boomers can get a decent standard of living when they retire? Will the economy be able to produce enough to sustain its non-working members—young and old? This is the real issue and it cannot be solved by cutting government spending nor by raising taxes today. Nor can it even be resolved by ramping up financial saving today—that would only lead to more dollars chasing scarce resources tomorrow. What matters is our capacity to produce goods and services in the future. If we want to be able to produce more in the future we need to invest more in education, technologies and infrastructure today. But if Kotlikoff thinks that we are redistributing “financial resources” from the young to the old (and I suspect that’s what he believes) then this is a false concern as explained below. First of all, as discussed in many posts on this blog, the government is the monopoly issuer of the country’s currency and hence it cannot go bankrupt. It doesn’t need tax or bond revenues to spend; it simply spends by crediting bank accounts which ultimately amounts to creating new currency (cash or deposits in commercial banks). It then sells government securities to drain any excess reserves that the banking system might receive as a result of government spending. This is done to help the Fed hit its interest rate target. And even if the government wanted to, it couldn’t spend your tax money. Why? Because just as government spending creates new money, taxing destroys money. Government cannot spend that which doesn’t exist. Both government bonds and currency are liabilities of the Federal government (Treasury and Fed), its IOUs. There is only one difference between the two – bonds pay higher interest than reserves. The government pays interest on bonds to offer an interest earning alternative to reserves. To get us to accept the currency, it imposes taxes on us. If currency is government’s IOU why would government need to borrow its own IOUs in order to spend? Furthermore, there is no balance sheet operation that allows one to borrow one’s own IOUs. When the government sells bonds, it simply exchanges one type of IOU for the other – this is not borrowing. When you deliver government’s IOUs to it to pay your taxes, it simply extinguishes your tax liability, just like you deliver bank deposits (bank IOUs) to a bank to discharge your obligations (bank loans) to it. If you could issue IOUs that were as acceptable as government IOUs, i.e. if everything was for sale in your IOUs, what kind of crazy idea would it be for you to borrow them back in order to spend? The second problem with Kotlikoff’s argument is his presumption that government can somehow run fiscal surpluses for years on end. As explained in many posts on this blog government’s fiscal surplus means that the non-government sector is running a deficit. In other words, the government is injecting less income into the private sector (through its spending) then it is draining out of it (through taxation). Assuming a 4% of GDP trade deficit (although it could shrink if the government cuts spending), the negative adjustment in private sector (firms and households) balances desired by Kotlikoff will be in the amount of 9% of GDP (5% government surplus + 4% current account deficit/foreign sector surplus). The private sector will be dissaving at a rate of 9% of GDP per year. Can this go on forever or for many years as the IMF says it should? In Kotlikoff’s world, where this somehow will have only positive effects, it can. But in the real world this is operationally impossible. For one thing, the private sector cannot indefinitely run a deficit without facing solvency problems – it is a user of the currency not the issuer. More importantly, a persistent federal budget surplus is impossible for a sovereign currency issuer like the US because the funds used to pay taxes ultimately come from government spending. If it continuously withdraws more funds from the economy then it’s injecting into the economy then at some point the private sector’s previously accumulated hoards of government IOUs will be depleted. People will simply be unable to pay their taxes. Deficit hawks such as Dr. Kotlikoff simply shift the public debate from pressing issues such as high unemployment to false concerns about fiscal solvency and debt sustainability. They devise numbers which are meaningless for a nation operating with a sovereign currency, and use these to misinform and scare ordinary people. They are the reason why the very people who benefit from successful government programs (such as Social Security) undermine their own economic well-being by electing deficit hawks to Congress. The academic experts calling for deficit reduction are irresponsible to say the least. They feel they can say anything without being held accountable for the impact of their ideas on the lives of people. We should devise some standard of accountability for professional economists, maybe similar to what we have for doctors. This would definitely throw some water on the deficit hysteria fire. With unemployment expected to remain high in the U.S. and Europe and the possibility of a double-dip recession growing stronger, some sensible voices are calling for another round of fiscal stimulus. And then there are others who not only argue that we don’t need more stimulus, but make a case for starting to cut spending today, notwithstanding a very fragile “recovery.” Ken Rogoff (see here), who has become the de-facto authority on the issue of sovereign deficits and debt (together with his co-author, Carmen Reinhart), in a recent FT article is trying to make the case for the redundancy of further economic stimulus. Subpar economic performance and unemployment are the usual companions of post-financial crisis recovery, he argues, hence there is no need for a “panicked fiscal response” (even Secretary Geithner has cited their research to demonstrate that the current slow pace of recovery is normal). Rogoff goes on to argue that the long-term effects of government debt accumulation on growth shouldn’t be ignored. The theoretical and empirical bases for his arguments are found in his recent book with Reinhart, This Time is Different, as well as an NBER paper, “Growth in Time of Debt”. This paper, similar to the book, has been very popular, especially among those needing empirical justification for their anti-fiscal policy stance. While the RR book focuses on the short-run, immediate impacts of sovereign debt (i.e. financial and economic crises), the focus of the paper is the impact of sovereign debt on long-term growth. In this blog I want to give a quick, critical evaluation of the paper (a longer version can be found here). When orthodox economists start their empirical research regarding the long-term impact of deficits and sovereign debt, they do not ask whether deficits contribute to or inhibit long-term economic growth. They do not ask, because they already “know” the answer, as the ECB put it: “Although fiscal consolidation may imply costs in terms of lower economic growth in the short run, the longer-run beneficial effects of fiscal consolidation are undisputed.” (ECB, Monthly Bulletin, June, 2010). What they want to find is some threshold for deficit-to-GDP and debt-to-GDP ratios beyond which debt becomes detrimental to growth. With this goal in mind, Rogoff and Reinhart embark on a “scientific” journey through time and space. Their method is actually quite simple: they construct some arbitrary ranges for debt-to-GDP ratios (0-30, 30-60, 60-90, >90) and take the average of growth rates for each range. They then take the average of these averages for a large number of countries and conclude that when the government debt-to-GDP ratio crosses the threshold of 90% (again, an arbitrary number), median growth rates fall by one percentage point and the average falls even more. This limit is the same for developed and developing countries, however, when it comes to external debt (which is defined in their book as both public and private debt issued in a foreign jurisdiction, and usually, but not always, denominated in foreign currency), the threshold is much lower, just 60% of GDP. Once a country crosses this lower external debt threshold, annual growth declines by about 2 percentage points and at very high levels, the growth rate is cut almost in half. Interestingly, however, average growth rates don’t monotonically decline, i.e. the average rate of growth is higher when debt-to-GDP ratio is in the 60-90% range than the lower range of 30-60%. In addition, growth rates don’t slow down for all the countries in their sample. For some countries the average growth rate is higher when debt is over 90% of GDP than for lower levels of debt. Reinhart and Rogoff don’t point out this “anomaly,” nor do they offer any explanations. More importantly, since they take the average of averages of a number of countries, it is possible that countries like the U.S. may drive the results for the whole group. They single out the case of the U.S. in their paper to demonstrate their results. However, a closer look shows that they only have 5 data points for the U.S. when the debt-to-GDP ratio was over 90%. This is only 2.3% of the total of 216 observations. Moreover, 3 out of these 5 observations are for the years 1945, 1946 and 1947, the period after WWII when government debt was high due to war spending. In this period, growth slowed down significantly as the government was withdrawing war spending from the economy. In 1946 alone, GDP contracted at a pace of -10.9%. Rogoff and Reinhart fail to even mention this in their paper. Similar situations might be true for many other countries, where high levels of debt-to-GDP follow extreme economic or political events. But what is even more important is that what they find in the data is merely a correlation. The causation then is imposed by Reinhart and Rogoff with explanations based on Barro’s Ricardian equivalence theory. “The simplest connection between public debt and growth is suggested by Robert Barro (1979). Assuming taxes ultimately need to be raised to achieve debt sustainability, the distortionary impact imply is likely to lower potential output” [sic]. There is no doubt about the correlation between high debt-to-GDP ratios and low economic growth found in the data. However, there is a more sensible explanation for this correlation. As explained in many past posts on this blog, the government budget balance automatically goes into deficit in a recession leading to an accumulation of public debt. Besides, GDP, the denominator of the ratio shrinks making the ratio even larger. It is sufficient to look at what happened during this most recent crisis to see this. The average rate of growth has been -0.23% for the recession years 2007-2009. At the same time, government debt held by the public has increased from 36% of GDP in 2006 to about 52% in 2009. So if you look at the data, the rate of growth was 2.7% in 2006 corresponding to a debt-to-GDP ratio of 36%. In 2009 growth was -2.6% with a corresponding debt-to-GDP ratio of 52%. Hence there is a correlation between slow growth and high levels of debt which is not surprising. But unless you want to argue that the current recession was caused by high levels of government debt, then it is obvious that causation runs from slow growth to high debt and not the other way around as Reinhart and Rogoff claim. They also find that growth deteriorates significantly at external debt levels of over 60% and that most default on external debt in emerging economies since 1970s has been at 60% or lower debt-to-GDP ratios (which is the Maastricht criteria). While this might be a surprising finding for them, it should be clear why countries are not tolerant to external debt which is almost always denominated in foreign currency. When a government borrows in foreign currency, even low levels of indebtedness can be unsustainable since the government is not able to issue that foreign currency to meet its debt obligations. As countries need to earn foreign exchange from exports, a sudden reversal in export conditions can render the country unable to meet its foreign debt obligations leading to a crisis and slower growth. Sovereign governments, on the other hand, do not face any financial constraints and cannot run out of their own currency as they are the monopoly issuers of that currency. They don’t need to increase taxes in the future (a la Barro) to pay off the debt as they make interest payments on their “debt” as well as payments of principal by crediting bank accounts, meaning that operationally they are not constrained on how much they can spend. See here for more on this. While many experts believe that there is an acute possibility of a double-dip recession in the U.S. (see here) and other developed nations, Ken Rogoff is not one of them. And even if we do face the threat, he argues, monetary policy will suffice (if anything, this crisis has demonstrated the ineffectiveness of monetary policy (interest rate management to be more precise) not to be confused with the massive lender-of-last resort operations that the Fed undertook to stabilize the financial system). Even if there was no threat of a double-dip recession, one could rightly argue that the current high levels of unemployment and underemployment require more government spending. Rogoff’s argument, however, is that sustained high unemployment is the normal consequence of a financial crisis and hence he seems to conclude that fiscal measures to solve the unemployment problem are unnecessary. This is very bad policy advice – we know we have a problem (unemployment), we know how to solve it (public works), but we shouldn’t do so for fear of growth slowing or markets disciplining the government at some indefinite time in the future, a fear based on the wobbly research of Reinhart and Rogoff. To summarize, the Rogoff and Reinhart research is not a scientific quest but merely a journey with a set destination. It is not based on any sensible theory, and the statistical analysis is of questionable quality as well. Government deficits and debt largely mirror what goes on in the private sector. There are no magic numbers for deficit and debt ratios applicable to all countries and all times. Devising such ratios is a useless exercise. Even in better times, the U.S. economy is operating with considerably high levels of unemployment and underemployment (see here), underscoring the necessity of government intervention in the economy. In a recession as the private sector cuts back its spending and tries to de-leverage, the role of government, as the only entity in the economy that can run persistent deficits without facing solvency issues, becomes especially important. Regardless of whether there is a threat of a double dip recession, the government should act to solve the unemployment problem through direct job creation TODAY. High levels of unemployment are not compatible with a democratic society. The Congressional Budget Office (CBO) has just released an 8-page brief titled “Federal Debt and the Risk of a Fiscal Crisis.” In it you will find all the traditional arguments regarding government deficits and debt: “unsustainability,” “crowding out”, bond rates rising to “unaffordable” levels because of fears that the Treasury would default or “monetize the debt,” the need to raise taxes to pay for interest servicing and government spending, the need “to restore investor’s confidence” by cutting government spending and raising taxes. This gives us an opportunity to go over those issues one more time. A government with a sovereign currency (i.e. one that creates its own currency by fiat, only issues securities denominated in its own currency and does not promise to convert its currency into a foreign currency under any condition) does not face any liquidity or solvency constraints. All spending and debt servicing is done by crediting the accounts of the bond holders (be they foreign or domestic) and a monetarily-sovereign government can do that at will by simply pushing a computer button to mark up the size of the bond holder’s account (see Bernanke attesting to this here). In the US, financial market participants (forget about the hopelessly misguided international “credit ratings”) recognize this implicitly by not rating Treasuries and related government-entities bonds like Fannie and Freddie. They know that the US government will always pay because it faces no operational constraint when it comes to making payments denominated in a sovereign currency. It can, quite literally, afford to buy anything for sale in its own unit of account. This, of course, as many of us have already stated, does not mean that the government should spend without restraint. It only means that it is incorrect to state that government will “run of out money” or “burden our grandchildren” with debt (which, after all, allows us to earn interest on a very safe security), arguments that are commonly used by those who wish to reduce government services. These arguments are not wholly without merit. That is, there may well be things that the government is currently doing that the private economy could or should be doing. But that is not the case being made by the CBO, the pundits or the politicians. They are focused on questions of “affordability” and “sustainability,” which have no place in the debate over the proper size and role for government (a debate we would prefer to have). So let us get to that debate by recognizing that there is no operational constraint – ever – for a monetarily sovereign government. Any financial commitments, be they for Social Security, Medicare, the war effort, etc., that come due today and into the infinite future can be made on time and in full. Of course, this means that there is no need for a lock box, a trust fund or any of other accounting gimmick, to help the government make payments in the future. We can simply recognize that every government payment is made through the general budget. Once this is understood, issues like Social Security, Medicare and other important problems can be analyzed properly: it is not a financial problem; it is a productivity/growth problem. Such an understanding would lead to very different policies than the one currently proposed by the CBO (see Randy’s post here). First, this sentence seems to imply that government activities are unproductive (given that, following their logic, Treasury issuances “finance” government spending), which is simply wrong, just look around you in the street and your eyes will cross dozens of essential government services. Second, the internal logic gets confusing for two reasons. One, if people are so afraid of a growing fiscal crisis, why would they buy more treasuries with their precious savings? Why not use their savings to buy bonds to fund “productive capital goods”? Using the CBO’s own logic, higher rates on government bonds would not help given that a “fiscal crisis” is expected and given that participants are supposed to allocate funds efficiently toward the most productive economic activity (and so not the government according to them). Second, we are told that “it is also possible that investors would lose confidence abruptly and interest rates on government debt would rise sharply.” I will get back to what the government can do in that case, but you cannot get it both ways; either financial market participants buy more government securities or they don’t. Third, this argument drives home the crowding-out effect. I am not going to go back to the old debates between Keynes and others on this, but the bottom line is that promoting thriftiness (increasing the propensity to save out of monetary income) depresses economic activity (because monetary profits and incomes go down) and so decreases willingness to invest (i.e. to increase production capacities). In addition, by spending, the government releases funds in the private sector that can be used to fund private economic activity; there is a crowding-in, not a crowding-out. This is not theory, this is what happens in practice, higher government spending injects reserves and cash in the system, which immediately places downward pressure on short-term rates unless the Fed compensates for it by selling securities and draining reserves (which is what the Fed does on a daily basis). No, as noted many times here, all spending and servicing is done by crediting creditor’s account not by taxing (or issuing bonds). Taxes are not a funding source for monetarily-sovereign governments, they serve to reduce the purchasing power of the private sector so that more real resources can be allocated to the government without leading to inflation (again all this does not mean that the government should raise taxes and takeover the entire economy; it is just a plain statement of the effects of taxation). All interest payments on domestically-denominated government securities (we are talking about a monetarily-sovereign government) can be paid, and have been met, at all times, whatever the amount, whatever their size in the government budget. If the US Treasury cannot issue bonds at the rate it likes there is a very simple solution: do not issue them. This does not alter in any way its spending capacity given that the US federal government is a monetarily-sovereign government so bond issuances are not a source of funds for the government. Think of the Federal Reserve: does it need to borrow its own Federal Reserve notes to be able to spend? No, all spending is done by issuing more notes (or, more accurately, crediting more accounts) and if the Fed ever decided borrow its own notes by issuing Fed bonds to holders of Federal Reserve notes (a pretty weird idea), a failure of the auction would not alter its spending power. The Treasury uses the Fed as an accountant (or fiscal agent) for its own economic operations; the “independence” of the Fed in making monetary policy does not alter this fact. It is always possible that anything can happen, but what is the record? The record is that there is no relationship between the fiscal position of the US government and T-bond rates. Massive deficits in WWII went pari passu with record low interest rates on the whole Treasury yield curve. With the help of the central bank, the government made a point of keeping long-term rates on treasuries at about 2% for the entire war and beyond, despite massive deficits. There is a repetition of this story playing out right now, and Japan has been doing the same for more than a decade. Despite its mounting government debt, the yield on 10-year government bonds is not more than 2% as of July 2010. In the end, market rates tend to follow whatever the central bank does in terms of short-term rates, not what the fiscal position of the government is. As we already stated on this blog before, a simple observation of how government finance operates shows that government spending injects reserves into the banking system (pressing down short-term interest rate), while the payment of taxes reduces/destroys reserves (pushing short-term rates up). The Fed has institutions that allow it to coordinate on a daily basis with the Treasury (they call each other every day) to make sure that all these government operations do not push the interest rate outside the Fed’s target range. That’s a repeat of the first question but with a bit of elaboration. The US government cannot default on its securities for financial reasons, it is perfectly solvent and liquid. (Sovereign governments can, as we have conceded on this blog, refuse to pay – e.g. Japan after the war – but that is because it was unwilling to repay, not because it was unable to pay.) Thus, despite Reinhart and Rogoff’s warnings, the credit history of the US government (and any monetarily-sovereign government) remains perfect. No government with a non-convertible, sovereign currency has ever bounced a check trying to make payment in its own unit of account. The US government always pays by crediting the account of someone (i.e. “monetary creation”). If the creditor is a bank, this leads to higher reserves, if it is a non-bank institution it leads also to an increase in the money supply. It has been like this from day one of Treasury activities. It is not a choice the government can make (between increasing the money supply, taxing or issuing bonds); any spending must lead to a monetary creation; there is no alternative. Again taxes and bonds are not funding sources for the US federal government; however they have important functions. Taxes help to keep inflation in check (in addition to maintaining demand for the government’s monetary instruments). Bond sales allow the government to deficit spend without creating excessive volatility in the federal funds market. If financial market participants want more bonds, the Treasury issues more to keep bond rates high enough for its tastes; if financial market participants do not want more treasury bonds, the government does not issue to avoid raising rates. The US Treasury (and any monetarily sovereign government as long as they understand it) has total control over the rate it pays on its debts; whether the government understands this or not is another question. A monetarily sovereign government does not have to pay “market rates” in order to convince markets to hold its bonds. Indeed, it does not even have to issue securities if it does not want to. 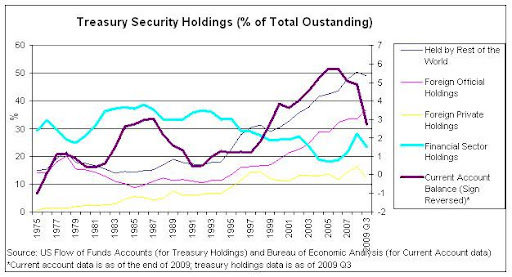 In the US, it is usually the financial institutions that beg the Treasury to issue more securities. Now look how this was deformed by the Treasury (quite a few journalists and bloggers followed): “The Treasury Department announced today the initiation of a temporary Supplementary Financing Program at the request of the Federal Reserve. The program will consist of a series of Treasury bills, apart from Treasury’s current borrowing program, which will provide cash for use in the Federal Reserve initiatives.” No, Mr. Treasury, this was not done for funding purpose; it was done to drain reserves from the banking system. The Fed does not need any cash from the Treasury. The Fed is the monopoly supplier of cash. A new book by Kenneth Rogoff and Carmen Reinhart, “This Time It’s Different: Eight Centuries of Financial Follies“, has occasioned much comment in the press and blogosphere (see here and here). The book purports to show that once the gross debt to GDP ratio crosses the threshold of 90%, economic growth slows dramatically. But that’s too simplistic: Debt to GDP is a ratio and the ratio value is a function of both the numerator and denominator. The ratio can rise as a function of either an increase in debt or a decrease in GDP. So to blindly take a number, say, 90% debt to GDP as Rogoff and Reinhart have done in their recent work, is unduly simplistic. It appears that they looked at the ratio, assumed that its rise was due to an increase in debt, and then looked at GDP growth from that period forward assuming that weakness was caused by debt instead of that the rise in the ratio was caused by economic weakness. In other words, they have the causation backwards: Deficits go up as growth slows due to the automatic counter cyclical stabilizers.They don’t cause the slow down, etc. As Randy Wray and Yeva Nersisyan have noted in a yet unpublished work, after the Second World War, the debt ratio came down rather rapidly-mostly not due to budget surpluses and debt retirement but rather due to rapid growth that raised the denominator of the debt ratio. By contrast, slower economic growth post 1973, accompanied by budget deficits, led to slow growth of the debt ratio until the Clinton boom (that saw growth return nearly to golden age rates) and budget surpluses lowered the ratio. The Ratio of the rates of change of Debt / GDP is rising faster than the change in Debt indicating that both the increase in Debt and the fall in GDP are contributing to a rising Debt / GDP ratio. For policy makers who obsess about a rising Debt / GDP ratio, they fail to understand that austerity measures that cut GDP growth will cause a rise in the Debt to GDP ratio. Basically, it boils down to this simple observation: it is foolish, dangerous, and thoroughly counterproductive to treat fiscal balances in isolation. In particular, setting a fiscal deficit to GDP target equal to expected long run real GDP growth in order to hold public debt/GDP ratios at a completely arbitrary (indeed, literally pulled out of thin air) public debt to GDP ratio without for a moment considering what the means for the feasible range of current account and domestic private sector financial balance is utterly nonsensensical. It is crucial that investors and policy makers recognize and learn to think coherently about the connectedness of the financial balances before they demand what is being currently called fiscal sustainability. 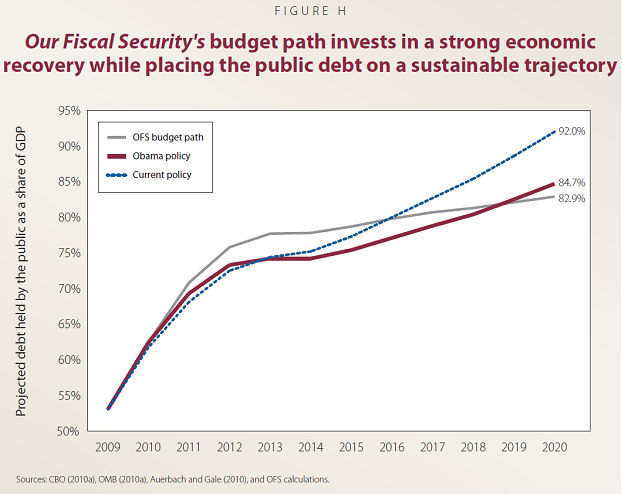 As it turns out, pursuing fiscal sustainability as it is currently defined will in all likelihood just lead many nations to further private sector debt destabilization. To put it bluntly, if the private sector continues to pursue a high net saving/financial surplus position while fiscal retrenchment is attempted, unless some other bloc of nations becomes large net importers (and the BRICs are surely not there yet), nominal GDP will fall in the fiscally “sound” nations, the designated fiscal deficit targets WILL NEVER BE ACHIEVED (there can also be a paradox of public thrift), and private debt distress will simply escalate. In fact, if austerity measures are based on measures of debt relative to economic growth there is a very real risk of a downward spiral where economic growth declines at a faster pace than government debt and the rising Debt / GDP ratio leads to ever greater austerity measures. At a minimum, focusing only on the debt side of the equation risks increasing the Debt / GDP ratio that is the object of purported concern is likely to lead to policy incoherence and HIGHER levels of debt as GDP plunges. The solution is to recognize that the increase in the ratio is in some fair measure the result of declining economic growth and that only by increasing economic growth will the ratio be brought down. This may cause an initial rise in the ratio because of debt financing of fiscal stimulus but if positive economic growth is achieved the problem should be temporary. The alternative is to risk a debt deflationary spiral that will be much more difficult (and costly) to reverse. The purpose of this paper is to present proposals for the Treasury, the Fed, and the banking system. Government begins with an assumption that it exists for public purpose, and I use that as the guiding assumption of my proposals. I begin with my proposals for the banking system, as banking operations influence both Fed and Treasury operations. U. S. banks are public/private partnerships, established for the public purpose of providing loans based on credit analysis. Supporting this type of lending on an ongoing, stable basis demands a source of funding that is not market dependent. Hence most of the world’s banking systems include some form of government deposit insurance, as well as a central bank standing by to loan to its member banks. Under a gold standard or other fixed exchange rate regime, bank funding can’t be credibly guaranteed. In fact, fixed exchange rate regimes by design operate with an ongoing constraint on the supply side of the convertible currency. Banks are required to hold reserves of convertible currency, to be able to meet depositor’s demands for withdrawals. Confidence is critical for banks working under a gold standard. No bank can operate with 100% reserves. They depend on depositors not panicking and trying to cash in their deposits for convertible currency. The U.S. experienced a series of severe depressions in the late 1800’s, with the ‘panic’ of 1907 disturbing enough to result in the creation of the Federal Reserve in 1913. The Fed was to be the lender of last resort to insure the nation would never again go through another 1907. Unfortunately, that strategy failed. The depression of 1930 was even worse than the panic of 1907. The gold standard regime kept the Fed from being able to lend its banks the convertible currency they needed to meet withdrawal demands. After thousands of catastrophic bank failures, a bank holiday was declared and the remaining banks were closed by the government while the banking system was reorganized. When the banking system reopened in 1934, convertibility of the currency into gold was permanently suspended (domestically), and bank deposits were covered by federal deposit insurance. The Federal Reserve wasn’t able to stop depressions. It was going off the gold standard that did the trick. It has been 80 years since the great depression. It would now take exceptionally poor policy responses for even the current severe recession to deteriorate into a depression, though misguided and overly tight fiscal policies have unfortunately prolonged the restoration of output and employment. The hard lesson of banking history is that the liability side of banking is not the place for market discipline. Therefore, with banks funded without limit by government insured deposits and loans from the central bank, discipline is entirely on the asset side. This includes being limited to assets deemed ‘legal’ by the regulators and minimum capital requirements also set by the regulators. burdens with severe social costs in the case of regulatory and supervisory lapses), banks should be prohibited from engaging in any secondary market activity. The argument that these areas might be profitable for the banks is not a reason to extend government sponsored enterprises into those areas. would have been avoided. The rates paid by US borrowers, including homeowners and businesses, would have come down as the Fed intended when it cut the fed funds rate. 4. Banks should not be allowed to accept financial assets as collateral for loans. No public purpose is served by financial leverage. 5. US Banks should not be allowed to lend off shore. No public purpose is served by allowing US banks to lend for foreign purposes. 6. Banks should not be allowed to buy (or sell) credit default insurance. The public purpose of banking as a public/private partnership is to allow the private sector to price risk, rather than have the public sector pricing risk through publicly owned banks. If a bank instead relies on credit default insurance it is transferring that pricing of risk to a third party, which is counter to the public purpose of the current public/private banking system. 7. Banks should not be allowed to engage in proprietary trading or any profit making ventures beyond basic lending. If the public sector wants to venture out of banking for some presumed public purpose it can be done through other outlets. than evaluation by credit analysis both serves no further public purpose and subverts the existing public purpose of providing a stable platform for lending. I have three proposals for the FDIC. The first is to remove the $250,000 cap on deposit insurance. The public purpose behind the cap is to help small banks attract deposits, under the theory that if there were no cap large depositors would gravitate towards the larger banks. However, once the Fed is directed to trade in the fed funds markets with all member banks, in unlimited size, the issue of available funding is moot. serves or doesn’t serve public purpose. bank loans, which continues to impede the desired growth of bank capital. 1. The fed should lend unsecured to member banks, and in unlimited quantities at its target fed funds rate, by simply trading in the fed funds market. There is no reason to do other wise. Currently the Fed will only loan to its banks on a fully collateralized basis. However, this is both redundant and disruptive. The Fed demanding collateral when it lends is redundant because all bank assets are already fully regulated by Federal regulators. It is the job of the regulators to make sure that all FDIC insured deposits are ‘safe’ and ‘taxpayer money’ is not at risk from losses that exceed the available private capital. Therefore, the FDIC has already determined that funds loaned by the Fed to a bank can only be invested in ‘legal’ assets and that the bank is adequately capitalized as required by law. There is no room for funding from the Fed to be ‘misused’ as banks already can obtain virtually unlimited funding by FDIC insured deposits. The only difference between banks funding with FDIC insured deposits and funding directly from the Fed might be the interest rate the bank may have to pay, however it’s the further purpose of the Fed’s monetary policy to target the fed funds rate. The Fed also tends to set quantity limits when it lends to its member banks, when there is every reason to instead lend in unlimited quantities. Bank lending is not reserve constrained, so constraining lending to the banks by quantity does not alter lending. What constraining reserves does is alter the fed funds rate, which is the rate banks pay for reserves as well as the Fed’s target rate. So the only way the Fed can fully stabilize the fed funds rate at its target rate is to simple offer to provide unlimited funds at that rate as well as offer to accept fed funds deposits at that same target rate. And with no monetary risk or adverse economic consequences for lending unlimited quantities at its target rate there is no reason not to do this. Another benefit of this policy would be to entirely eliminate the inter bank fed funds market. There is no public purpose served by banks trading fed funds with each other when they can do it with the Fed, and transactions costs are reduced as well. And to eliminate the inter bank markets entirely the Fed has the further option to provide funding with an entire term structure of rates to its banks to both target those rates and also eliminate the need for any inter bank trading. 2. I would limit the Fed to using banks as agents for monetary policy. I would not pursue the policy of attempting to establish additional public/private partnerships for the purpose of buying various financial assets. Instead, if I agreed with the need to purchase those assets, I would enable the banking system to do this along the same lines proposed for the new public/private partnerships. That might take the form of allowing banks to put these ‘qualifying assets’ in a segregated account, where losses to bank capital would be limited to, for example, 10% of the investment in those accounts. This would have the same result as the recently proposed public/private partnerships but within the existing highly regulated and supervised banking system. Banks are the appropriate instrument of monetary policy for targeting the risk adjusted term structure of interest rates. Why go to the expense and risk of creating new public/private partnerships when there are already approximately 8,000 member banks already set up for that purpose? 3. I would make the current zero interest rate policy permanent. This minimizes cost pressures on output, including investment, and thereby helps to stabilize prices. It also minimizes rentier incomes, thereby encouraging higher labor force participation and increased real output. Additionally, because the non government sectors are net savers of financial assets, this policy hurts savers more than it aids borrowers, so a fiscal adjustment such as a tax cut or spending increase would be appropriate to sustain output and employment. 4. I would instruct the Fed to offer credit default insurance on all Treasury securities through its banking system to any buyer. There is no default risk in US Treasury securities, but, if market participants do want to buy such credit default insurance, I would make it available through the Fed. This would keep the premiums and the perception of risk down to a level determined by the Fed. I would suggest they offer it freely at 5 basis points for any maturity. 1. I would cease all issuance of Treasury securities. Instead any deficit spending would accumulate as excess reserve balances at the Fed. No public purpose is served by the issuance of Treasury securities with a non convertible currency and floating exchange rate policy. Issuing Treasury securities only serves to support the term structure of interest rates at higher levels than would be the case. And, as longer term rates are the realm of investment, higher term rates only serve to adversely distort the price structure of all goods and services. 2. I would not allow the Treasury to purchase financial assets. This should be done only by the Fed as has traditionally been the case. When the Treasury buys financial assets instead of the Fed all that changes is the reaction of the President, the Congress, the economists, and the media, as they misread the Treasury purchases of financial assets as federal ‘deficit spending’ that limits other fiscal options. I conclude with my proposals to support aggregate demand and restore output and employment. 1. A full payroll tax holiday where the Treasury makes all the contributions for employees and employers. This immediately restores the purchasing power of those still working and enables them to make their mortgage payments which also stabilizes the banking system. 2. I would distribute $150 billion of revenue sharing to the State governments on a per capita basis. This would stabilize State governments currently cutting back on public services due to revenue short falls caused by the recession. Distribution on per capita basis makes it ‘fair’ and does not ‘reward bad behavior. 3. I would have the Federal government fund $8/hr full time jobs for anyone willing and able to work, that includes health care benefits. This provides an employed labor buffer stock that’s a superior price anchor to our current unemployed buffer stock. This helps support an expansion in private sector employment as the economy improves. It’s been demonstrated that the private sector prefers to hire those already working rather than those who are unemployed. These three proposals, along with above proposals for the Fed, the Treasury, the FDIC, and banking system, will quickly restore the US economy to positive growth, full employment, and establish a banking system that will promote the intended public purpose and require less regulation while substantially reducing the systemic risk inherent in our current institutional arrangements.